What did Haydn sound like while he was on tour in London, giving concerts and teaching? Today, nobody perhaps comes closer to the sound from that time than Rebecca Maurer, who plays here on her original London fortepiano from 1816. Furthermore, the internationally sought-after fortepiano virtuoso does this with dazzling technique and immaculate stylistic confidence. The repertoire is also sensational, above all because it is not every day that one finds world premiere recordings by Haydn students on program flyers: fragrant music of Sentimentalism with some hints of Romanticism by Thomas Haigh and Christian Ignatius Latrobe. Outstanding repertoire! "...an intresting recital, well played and recorded." Listen to the Review hereon the website of BBC Radio 3. 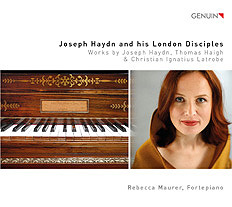 "Maurer plays the lesser works of Haigh and Latrobe with as much insight and respect that she brings to the Haydn. To cap off what is both an interesting and extremely well-played and recorded CD, the presentation is exemplary, including not only notes on music and performer but also colour photographs and a description of the piano. "Read the whole review of 02.04.2019 on the website of Early Music Review. „Canzonetta II: Rondo. Allegretto“ from Three Canzonettas of Dr. Haydn’s (1796) was played in SWR2 Musikstunde on 28.03.2019.